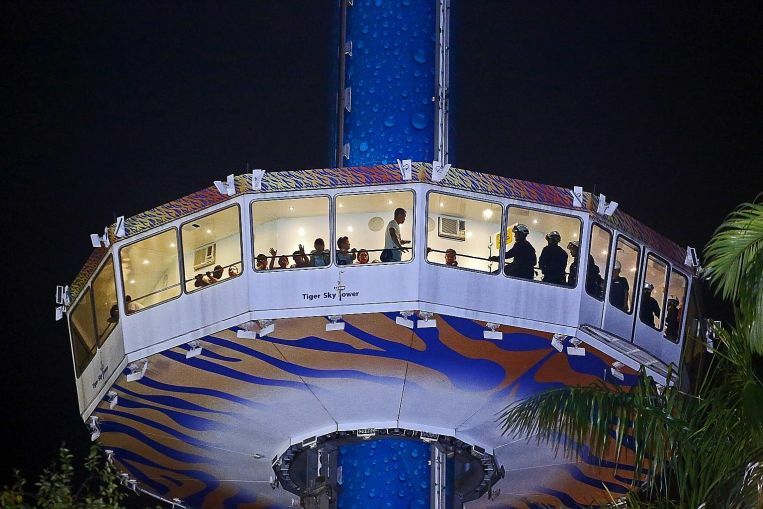 A mechanical fault with the Tiger Sky Tower attraction on Sentosa on Saturday (Aug 12) afternoon left 39 people stranded 25m in the air - about eight storeys high - for more than four hours. The glitch occurred at 5.35pm. It was only at 9.45pm that the gondola was finally lowered to ground and all on board, including children and the elderly, were able to disembark. All of them were "doing fine", said the Singapore Civil Defence Force (SCDF), which was called in at 7.10pm. In a statement on Sunday, the Building & Construction Authority (BCA), which regulates amusement rides, said it was alerted to the "system malfunction" and dispatched its engineers to investigate. "BCA has issued a closure order to suspend the ride from operation," it added. Sky Tower director Alexander Melchers said after the incident that engineers had conducted maintenance checks on Saturday morning prior to the ride - as is the usual practice. "We have a very strict maintenance regime, but at this point of time, I cannot confirm the cause for what happened." Mr Melchers also said that the gondola was never at risk of plunging completely as the ride has failsafes similar to elevators. His firm will reach out to the ride's German manufacturer, Huss Park Attractions, even as it works with BCA to decide when the tower can continue operation. The Sky Tower, launched in 2004, reaches 110m. It can ferry up to 72 passengers to the top via an enclosed, air-conditioned cabin, also known as a gondola. The seven-minute ride affords views of Sentosa, Singapore, and parts of Indonesia and Malaysia. 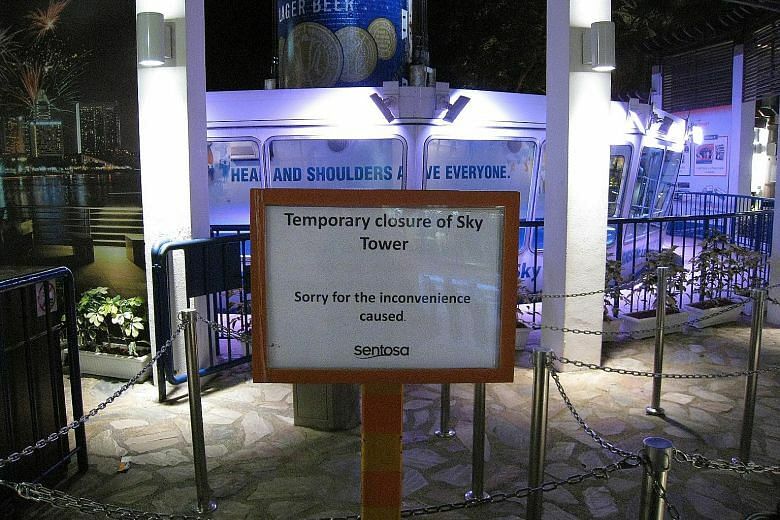 The Sentosa Development Corporation (SDC) said last night that when operations at the tower were suspended at about 5.35pm, there were 38 passengers, most of whom were tourists, and one operator in the gondola. •5.35pm: A mechanical fault left 38 passengers and one operator trapped in the gondola of the 110m-tall Tiger Sky Tower on Sentosa at 25m above ground. Bottles of food and water were distributed to guests as engineers from the tower worked to lower the gondola. •Around 5.50pm: Sentosa rangers were called in to assist the engineers with mechanical winching to lower the gondola. •7.10pm: The Singapore Civil Defence Force was called in for assistance. •Around 9.30pm: The gondola started moving again but soon stopped. A walkie-talkie from a rescuer nearby blared "stuck again". A large crowd gathered at the scene. •9.45pm: The gondola was lowered back on the ground. All 38 passengers and one operator on the ride emerged safely, with no reported injuries. The Sky Tower's on-site technical team "immediately began troubleshooting the system", said the SDC. Bottles of water and food were distributed to guests, as Sky Tower engineers worked to lower the gondola. Air-conditioning in the gondola, which also has a mobile toilet, continued to run while it was stalled in mid-air. The SCDF sent two fire engines, two Rescue Tenders and an ambulance to the incident, though no injuries were reported. The elite Disaster Assistance and Rescue Team (Dart) was also dispatched. Dart rescuers climbed to the top of the tower before rappelling down and into the gondola - with the team on standby to rescue the passengers from height. But with a large crowd watching, technicians were able to lower the gondola intermittently until it reached the ground. This is not the first time that the Sky Tower has run into problems. In 2010, the tower stalled in mid-air in two separate incidents, and it took around two hours for the issue to be resolved in each of the previous incidents. Standing at 131m above sea level, the Tiger Sky Tower on Sentosa Island is the tallest observatory tower here, according to Sentosa's website. Introduced in 2004, the 110m-tall Sky Tower - initially known as the Carlsberg Sky Tower - ferries up to 72 passengers to the top via an enclosed, air-conditioned cabin, also known as a gondola. The ride affords views of Sentosa, Singapore, and parts of Indonesia and Malaysia. In 2010, there were two occasions in which the tower ran into problems. In July that year, the tower had to be closed when it stalled with 10 tourists on board. The ride got stuck at the 55m mark during its descent, due to an uneven curvature on the track which affected the balance of the cabin. Sentosa staff and Singapore Civil Defence Force (SCDF) personnel escorted the tourists, who were from Malaysia, down the emergency staircase. It took less than two hours for all tourists to be escorted down. In June 2010, 36 passengers were left stranded 30m in the air for more than two hours when the ride stalled on its way down due to a mechanical fault. The ride was restarted after more than two hours, after the SCDF and police were called in to help.